CGNMapper is a new product in NoviFlow’s DSO portfolio that provides a powerful and economical solution for scaling Carrier Grade NAT tool farms to the ever-increasing throughput demanded by today’s internet traffic. It incorporates a packet processing pipeline architecture optimized specifically to enable multi-Terabit scaling of CG-NAT traffic utilizing commercial CGNAT tool farms. CGNMapper delivers a unique SDN-based solution to the CGN scaling problem. Within the Tool Farm each CGN device is assigned specific public IP address blocks that it can use for the CPE private IP to public IP mapping. This dictates that when a specific CPE flow hits a specific CGN device that all future packets for that flow from that CPE have to hit the exact same device. It also means that packets that are part of that flow returning from the Internet (with a NATed public IP address) have to return to the exact same CGN device. The Scaling Services in CGNMapper lock this privateIP/publicIP/device relationship while scaling the huge traffic flow from a large CPE environment across a CGN Tool Farm. Interface to define and modify a Tool Farm of CGN devices. 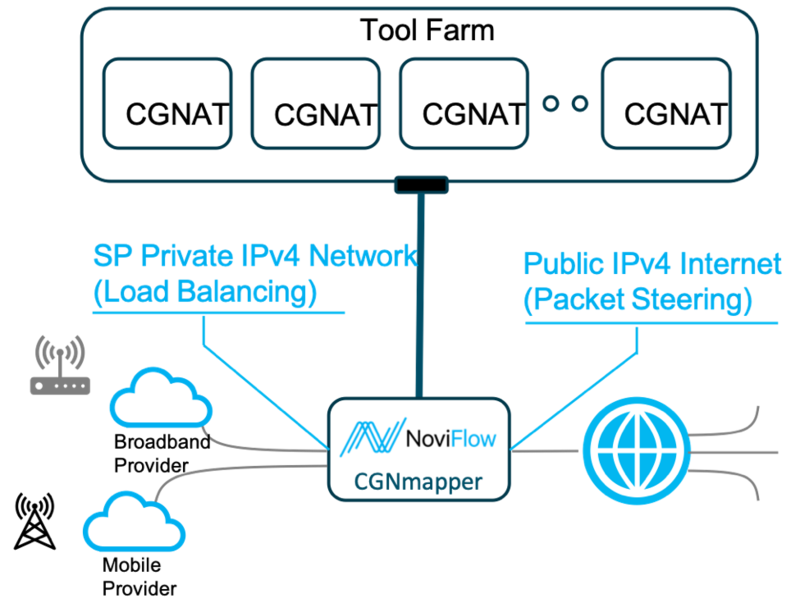 NoviFlow Enumerated Hash load balancing technology for distributing packet flow from CPE, with private IP addresses, to devices in CGN Tool Farm. Proprietary algorithm that for the life of a Private flow, and its Public Internet response, both are pinned to a specific CGN Tool. This enables the NAT mapping of flows, and the associated database, to be divided and isolated to specific Tools within the Farm. Public IP address filtering technology that returns packets form the Internet to the specific Tool that is managing the Private/Public IP mapping for that Public address. CGNMapper offers a REST API interface is used by the Tool Farm orchestration software to programmatically coordinate the CGNMapper scaling services with the state of the devices within the Tool Farm. Interface to map blocks of Public IP addresses to a specific device within the Tool Farm. This is done for each device. Operational Dashboard to Visualize Tool state and loads. Enable Scaling capacity of Tool Farm. Simplify configuration and management of flows to tools. High Availability (HA) support for link, switch, CGN Tool, and CGNMapper Controller. API interface for integration with 3rd party Orchestration package if required. Cost-effective, dynamically scalable, multiple Terabit CG-NAT services. Efficiently address even the largest deployments and enable cost-effective dynamic scaling to right-size capacity for even the most highly variable demand. Automation of address handling reduces network complexity and operating costs. Works with existing Fortinet CG-NAT tool farms and installations.